AU President Steven Leath and his wife, Janet, from left, join Cathy and Rennie Bickerstaff at Auburn’s opening 2017 football game, where the Bickerstaffs assisted in the pre-game flight of Spirit. Shown at right is Raptor Specialist Andrew Hopkins with Spirit. Since finding and rescuing a baby bald eagle that had fallen from its nest on their farm property, the Bickerstaffs of Columbus, Ga., have had a passion for the rescue and rehabilitation program at the Southeastern Raptor Center at the Auburn University College of Veterinary Medicine. “Our love of Auburn goes even further back,” said Cathy Bickerstaff, whose husband, Rennie, is a 1970 alumnus of Auburn Univesity’s Raymond J. Harbert College of Business. 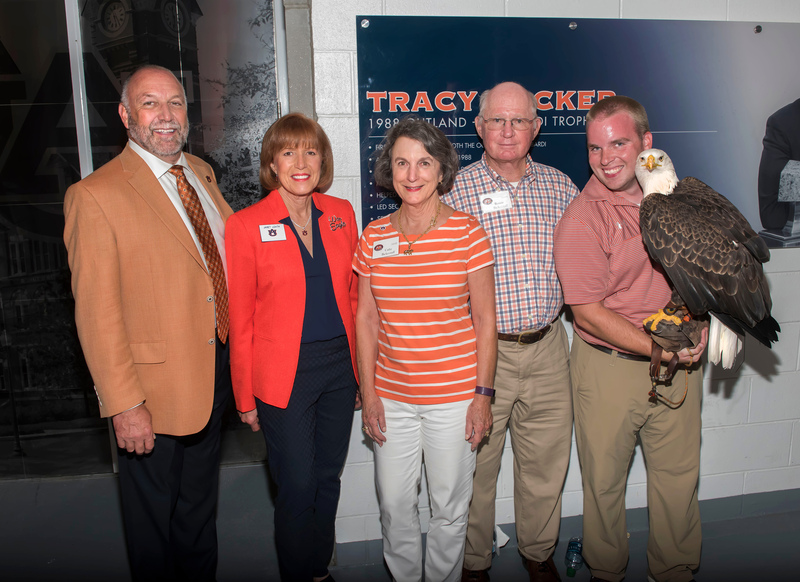 In recognition and to show appreciation for their support, the Bickerstaffs were invited to assist with the pregame eagle flight to open Auburn’s 2017 football season against Georgia Southern. The Bickerstaffs also were the bidding winners of the jess and lure auction for that game. “That added a permanent memento, along with the honor of participating in the eagle flight,” Mrs. Bickerstaff said.